….During Hill's tenure, Gwinnett acquired 7,000 acres of park land, a county bus service and a new college campus, while growing from a rural bedroom to an economic powerhouse. I worked closely with Wayne Hill in regional and ACCG activities over a period of 8 years. He is a natural leader and is a likable person. He is a native of Gwinnett County and had much pride in his county. Some press coverage ‘painted’ him as “growth dominated”. This is a “chicken and egg” dilemma. What caused what? I believe that Wayne did a great job dealing with the inevitable growth coming to his county. Its proximity to Atlanta, Lake Lanier and Interstates, and enlightened leadership, made it grow. Wayne Hill was responsible for the acquisition of several thousand acres of greenspace, a University, a $50 Million “state of the art” waste water treatment plant. Great leaders and leaders with vision are not always appreciated during their term in office. Wayne Hill’s legacy and reputation will be positive for many years to come. We wish him and his lovely wife, Carolyn, well in their private life. It is well deserved. 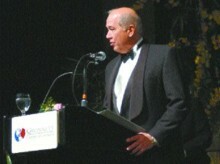 In 2000, Wayne Hill Presented Wendell Dawson the ACCG Emory Greene Leadership Award. Hill was a previous recipient. Wayne Hill was a friend and was a visionary leader. LAWRENCEVILLE — Wayne Hill’s reputation as a growth advocate may have cost him a fourth term, but some of his last acts before leaving office affirmed his love of nature. While Hill will remain in office for several more days, on Tuesday, he presided over his last meetings, helped plant a tree, broke ground on a museum dedicated to the environment, awarded some scholarships and honored fallen staffers. A few of Wayne Hill’s last official acts may define his legacy. The center will be located at the state-of-the-art sewage treatment plant named in the chairman’s honor, the F. Wayne Hill Water Resources Center. Hill never attended college, but the award included setting up scholarships in his name. The winners announced at the ceremony Tuesday are Megan Sulpy, a senior at Buford High School; Toby Whiting, a senior at North Gwinnett High School; and Sean Bright, a senior at Collins Hill High School. The heritage center is a joint venture between the Board of Commissioners, Board of Education and the University of Georgia……... The 200-acre site will feature a greenway, a wetlands area and nature trails with geologic and historic interpretive markers. …….. the Board of Commissioners approved resolutions of recognition honoring Hill for his 12 years of service as chairman, County Administrator Charlotte Nash, who is retiring after 27 years of working for the county, and outgoing commissioners Marcia Neaton and John Dunn. Wayne Hill never saw himself as the Sultan of Sprawl. He blames the media for that nickname…. "Somebody is going to have to build some more roads," the 63-year-old Gwinnett County Commission chairman said Tuesday, the day he presided over his final commission meeting. "We're going to have to inconvenience some people. Nobody wants a road next to their house." Nobody likes traffic either, he said, although it is the surest and most painful sign of a booming county's success. "I didn't ask anybody to come to Gwinnett County, but what kind of shape would we be in if I hadn't reacted to it?" asked Hill, who over the past 12 years has overseen approximately 565 miles of road laid in the 437-square-mile county. "I didn't say 'Pave it and they will come.' They came and I paved it." During Hill's tenure, Gwinnett acquired 7,000 acres of park land, a county bus service and a new college campus, while growing from a rural bedroom to an economic powerhouse. "That is the thing most people don't identify with me and I blame you [the media] for that," he said. "You called me the Sultan of Sprawl. I don't think I'm pro-development at all. I think I reacted to 300,000 people moving here." But in November, Gwinnett's voters seemed to say they had weathered enough change. They ousted Hill for Charles Bannister, a proponent of "managed growth" who takes office next month. On Tuesday, Hill presided at a series of events that reflected the changes brought by the county's growth. Ground was broken for a museum geared toward water conservation on 200 acres at the F. Wayne Hill Water Resources Center…………. Hill said Tuesday he doesn't know what he'll do once he leaves office. He may run again for political office, although he says the only kind of jobs that would interest him now are governor, lieutenant governor or secretary of state. "They tell me the only thing that can get politics out of your system is embalming fluid," he said. Or, he said, he might join the lucrative world of consulting and lobbying. Or maybe, he joked, he might just try developing some land himself. After all, he lives on 25 picturesque acres in Suwanee and owns 3 acres on Peachtree Industrial Boulevard, his family's homestead, now home to the remains of his cabinet-making business, which burned down a couple of years ago. "I'm just kidding about the development, but you learn never to say never," he said. "That might be my retirement. They're putting up 275 houses right behind my barn." After all, he said, development has its benefits. For proof, all he has to do is visit the elementary school in Sugar Hill and remember what it was like when he learned his "three R's" as a child. Overall, he's happy with the way things have gone in the county on his watch. "I think it's been a good run," he said. "I've done a good job. You can look around and see things are better." LAWRENCEVILLE — Nearly four months after they fought in an election, Chairman Wayne Hill and his successor Charles Bannister sat down to a “cordial” conservation about the future of Gwinnett County. The two talked for an hour and a half Monday about Gwinnett, the state’s third-largest county which is undergoing its first turnover at the top in 12 years. Bannister, a longtime state legislator, beat Hill during the Republican primary runoff in August and defeated Democrat Jamil Imran on Nov. 2. Both men said the conversation was less about specific issues and instead about governing in general. Bannister has been involved in state and city politics for three decades but has never served at the county level. Most of his questions revolved around the county’s $.5 billion budget proposal. As required by law, Hill revealed a blueprint for the 2005 spending plan, but it will be Bannister who will vote on it during the first meeting in January. “We talked about the overall cost and how we got to where we are,” Bannister said. At this point, Bannister said he hasn’t seen a copy of the proposal and would not comment on the specifics. Hill said he remembers the transition when he was first elected in 1992. “I can remember sitting on my porch the day after the election and thinking, ‘What have I gotten myself into?’ It’s a big job,” Hill said. “I had a steep learning curve and that will be the case probably again. It’s kind of overwhelming.”…. “I’m moving as fast as I can,” Bannister said, adding that he would give more information about his upcoming administration in the coming weeks.